2016 Update: The economic downturn in Oklahoma limited even our strongest companies' abilities to provide the resources necessary to complete this thorough application process. For that reason, the Compass Awards were temporarily postponed. However, OK Ethics was pleased to honor top leaders with the COMMUNITY IMPACT AWARDS. Also, we were delighted to honor Peter Dobelbower of Hobby Lobby with the 2016 EXECUTIVE PILOT AWARD. Please download the program below for more details about those who are promoting integrity at work in Oklahoma! CONGRATULATIONS TO OUR 2015 COMPASS AWARD WINNER! 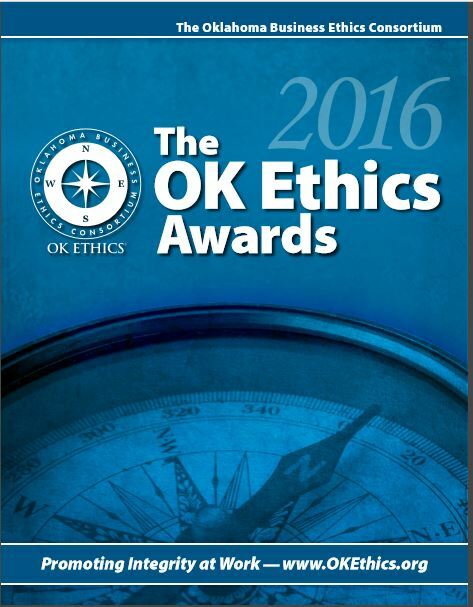 Click here to download 2015 OK Ethics Awards Program. Click here to view ceremony video. To view full application, including detailed supporting documentation, you must make an appointment with the OK Ethics Founder. We do not share this information with the winner's competitors. CONGRATULATIONS TO OUR 2014 COMPASS AWARD WINNERS! CONGRATULATIONS TO OUR 2013 COMPASS AWARD WINNERS! Special Community Impact Award to Dove Science Academy and SandRidge Energy/ Public Strategies for their extraordinary efforts to promote ethics on Oklahoma campuses. CONGRATULATIONS TO OUR 2012 COMPASS AWARD WINNERS! 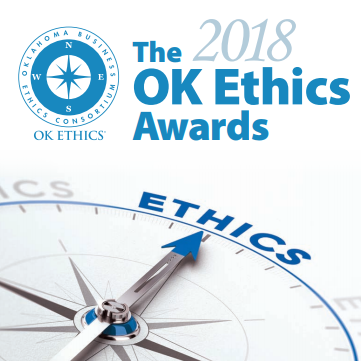 HONORABLE MENTION TO: HoganTaylor LLP; Ideal Homes of Norman and Pelco Products, Inc.
Special Community Impact Award to ONEOK, Inc. for their extraordinary efforts to promote ethics on university campuses. HoganTaylor ONEOK, Inc Pelco Products, Inc. Note that supporting documentation provided by companies often include proprietary information. For that reason, this data is often not provided on this site. Note that companies are permitted to reapply for the award after three award periods have passed. This means that the 2006 recipients are eligible to reapply in 2009 and so forth.